This truck was custom built for towing larger commercial vehicles, construction equipment, storage containers and forklifts. The bed is 26 feet long on air ride. And the bed can carry up to 16,000 lbs. 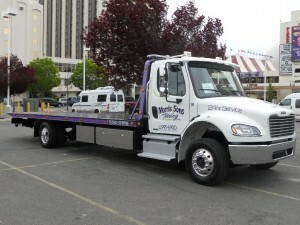 It has a low profile subframe, and the ability to legally haul taller loads such as catering trucks, box trucks, etc.